Apesar de seu tamanho pequeno (140x90x60 mm) esta câmera tem características muito boas. Com o seu sensor CMOS de 5 MP ela pode capturar imagens em formato JPEG em resolução de 5 ou 12 (com interpolação) МР e vídeo em formato AVI de 649x480 pixels. A câmera foi projetada para operar em condições extremas de -30 a +70 graus Celsius. Com o seu desenho único do sensor de movimento ela poderá cobrir uma área de cerca de 120 graus e com o seu tempo de ativação de 1 segundo garantirá a você capturar cada objeto passado em sua frente. A câmera tem consumo muito baixo e, portanto, com 8 pilhas de 1.5 V do tipo AA ela poderá ficar meses em modo stand-by. O dispositivo tem um ecrã colorido de 2.5 polegadas onde você poderá rever os seus registros imediatamente. A câmera gravará em cartão SD, do qual o tamanho máximo poderá ser de 16 GB. Os diodos infravermelhos assegurarão uma gravação de boa qualidade mesmo a noite. As imagens registrarão também a data, a hora, a temperatura e a fase da lua. 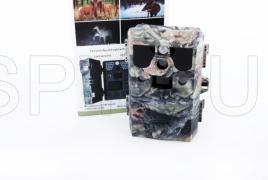 With this hunting camera you can take pictures of birds and animals in fullHD resolution. You can choose between two modes videos and photos. You can take pictures with a resolution of 2, 5, 8 or 12 MP. In the video you can choose between 1920x1080 pixels or 1080x720. With its compact size 134x98x59,5 mm this camera can be completely invisible. 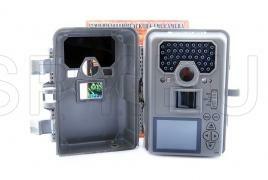 It can take images or capture audio-video files. Pictures are 5, 8 or 12 MP and video can be set between 320x240, 640x480, 720x480 or 1280x720 pixels. Files are saved on the SD card and you can insert up to 32 GB cards. Infrared diodes illuminate objects up to 20 meters. 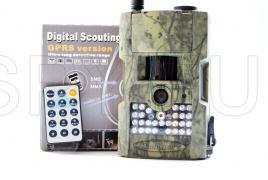 For precise targeting there is a laser pointer, which is controlled by a magnetic switch. 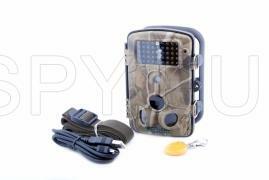 The battery capacity 1500 mAh is suitable for powering our hunting camera HD49 or other devices powered by 7V DC voltage and up to 800 mA power consumption. The solar panel with power current 0.4 W makes sure the battery is charging in daylight so that it can be used later at night. This this way you will rest assured that the camera will operate for a very long period of time. The battery has a degree of protection IP54 and can be used in humidity conditions from 5 up to 95%. The operation temperature range is from -22 to +70 degrees. 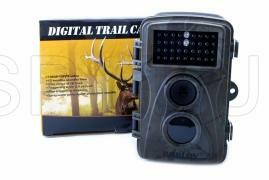 With this hunting camera you can take pictures and video in extremely high resolution. You can choose between two resolutions of the audio-video file - 1920x1080 or 1280x720 pixels. For pictures the choice is between 2, 5, 8 or 12 MP. For filming from a greater distance there are four times digital zoom. The motion detector has a range of 65 degrees. Thanks to its infrared diodes this device can capture an objects up to 25 meters away in complete darkness. The camera is powered by alkaline AA batteries and there is an indication, you can see how much time the camera can work with them on the camera screen. On 2" TFT display you can adjust all the camera settings. Recordings are stored on the SD card. In the slot of the device you can insert up to 32 GB. Dimensions 13.5x9x6cm, weight 380g. The small size of this camera will allow you to hide it will so it will go unnoticed. 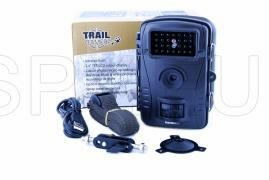 This makes it suitable for capturing wild animals and for securing various objects. 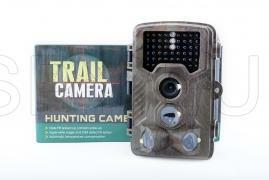 The camera will successfully "capture" any offender by recording video, audio and photos. 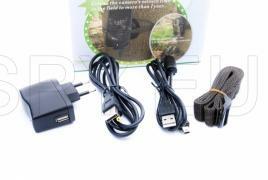 You can select between three modes of video 1280x720, 640x480 or 320x240, and photos can be selected between 2, 5 or 8MP. To get an image at night there are 26 IR LEDs that illuminate objects in the dark up to 10 meters. The recordings are saved on a microSD card and in the slot of the camera, you can insert up to 32GB cards.